There's so much to love about Luke's Toy Factory's line of toy trucks, we're not quite sure where to start in telling you about them. Is it the reclaimed or recycled materials that go into the toys' bodies? Is it the component parts that can be switched from one model to the other? Is it the proudly made in the USA manufacturing policy? Or is it simply the appealing, old-school design? Well, of course, there's more to the story than that, so keep on truckin' through to learn more about this inspiring company. A few years ago, the eponymous Luke and his father, Jim, were alarmed to notice some major manufacturers’ high-profile toy recalls. Concerned too about the sweatshop labor practices that were often used to produce the toys, they decided there must be a better way–and they chose to pursue it. Basing their manufacturing in the US, hand assembling the toys and using only US-produced materials were a big part of their quality-control plan and the result of their wish to avoid unjust labor conditions. When it came to the design of their trucks, Luke particularly wanted to recapture the warmth of the wooden toys of his childhood, but also to combine this with state-of-the-art manufacturing processes. 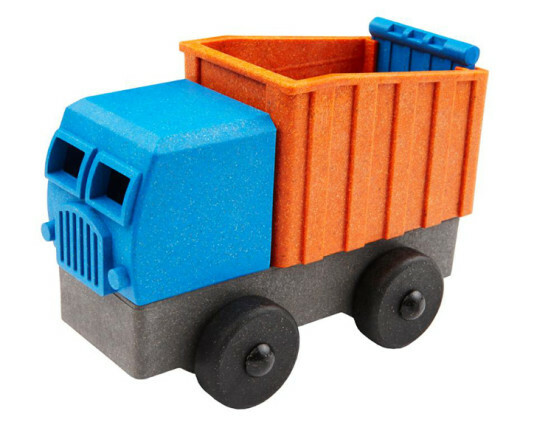 The result is a range of toy trucks that are 3D printed using Wood Plastic Composite (WPC), an extremely durable product made of 30% reclaimed sawdust from the furniture manufacturing industry and 70% certified plastic pellets. Almost all the plastic used in the toys is recycled, with the exception of the pellets used for the wheels and axles for reasons of strength. As soon as a recycled plastic pellet comes along that’s a suitable substitute, the company will switch to that. The gorgeous, bright and child-safe colors of the trucks are also mixed into the WPC: the trucks aren’t going to peel, flake or smudge since they aren’t painted. In the unlikely event that your child tires of their toy, the WPC material can also be recycled, but your local facility may not be equipped to do so just yet, so Luke’s heartily recommends donating any unwanted trucks. The trucks currently come in three designs: a fire truck, a dump truck and a cargo truck. Each is designed with multiple component parts that can be mixed and matched on the universal chassis–options that are intended to encourage kids’ creative play. 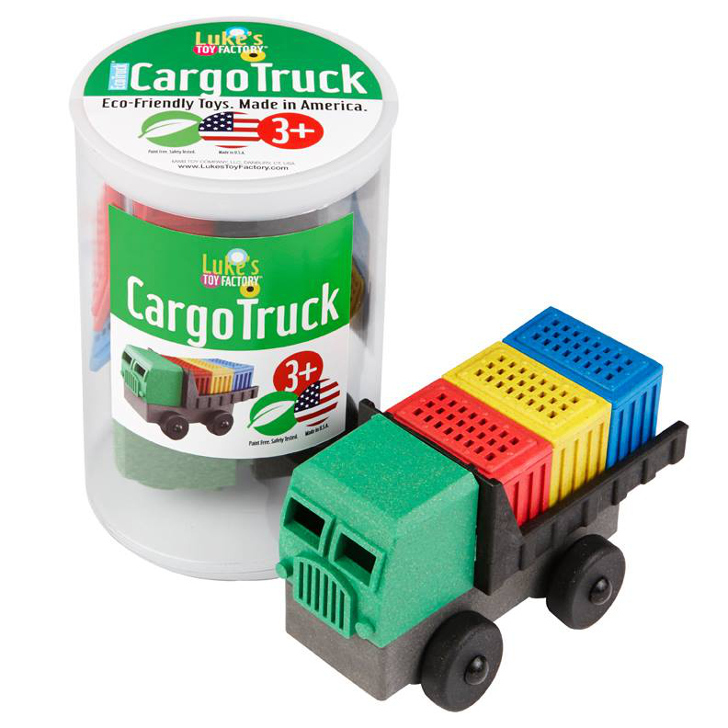 As multi-part stacking toys, the trucks are recommended for ages 3 and up. The trucks are available direct from the Luke’s Toy Factory online shop, with a single truck costing just $22.95, and free shipping by USPS in the USA. All toys come in child-safe, bioplastic packaging too, making them a fabulous and affordable gift. A few years ago, the eponymous Luke and his father, Jim, were alarmed to notice some major manufacturers' high-profile toy recalls. Concerned too about the sweatshop labor practices that were often used to produce the toys, they decided there must be a better way--and they chose to pursue it. Basing their manufacturing in the US, hand assembling the toys and using only US-produced materials was a big part of the company's quality-control plan and the result of their wish to avoid unjust labor conditions. When it came to the design of their trucks, Luke particularly wanted to recapture the warmth of the wooden toys of his childhood, but also to combine this with state-of-the-art manufacturing processes. The result is a range of toy trucks that are 3D printed using Wood Plastic Composite (WPC), an extremely durable product made of 30% reclaimed sawdust from the furniture manufacturing industry and 70% certified plastic pellets. Pictured here is an uncolored prototype of the fire truck, which is not for sale. The gorgeous, bright and child-safe colors of the trucks are also mixed into the WPC: the trucks aren't going to peel, flake or smudge since they aren't painted. Almost all the plastic used in the toys is recycled, with the exception of the pellets used for the wheels and axles for reasons of strength. As soon as a recycled plastic pellet comes along that's a suitable substitute, the company will switch to that. The trucks currently come in three designs: a fire truck, a dump truck and a cargo truck. Each is designed with multiple component parts that can be mixed and matched on the universal chassis--options that are intended to encourage kids' creative play. As multi-part stacking toys, the trucks are recommended for ages 3 and up. The trucks are available direct from the Luke's Toy Factory online shop, with a single truck costing just $22.95, and free shipping by USPS in the USA. All toys come in child-safe, bioplastic packaging too, making them a fabulous and affordable gift.